"The greatest meeting of land and water in the world." Strong words for a beautiful place. The "Point of the Sea Wolves" (sea lions) is certainly a beautiful place. But had Mr. McComas already seen the Big Sur coastline further south? We don't know for sure. So whether what he said holds true for you, or not, is for you to judge. But, generally definitions of what constitutes "Big Sur" takes in everything south of the Carmel River (and Point Lobos is south of there) to San Carpoforo Creek right at Ragged Point at the south end. 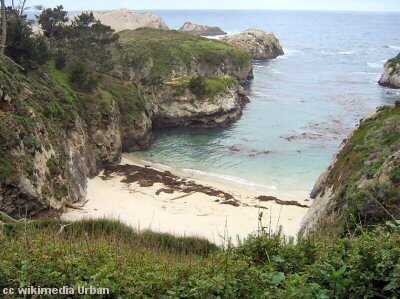 One of the nice things about this unique State Natural Reserve is that it close to Monterey and Carmel (less than 4 miles from the center of Carmel). 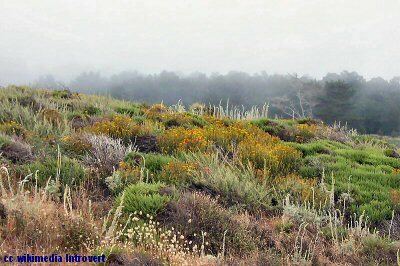 Shown below is a map of the Point Lobos Reserve with all the roads, parking and trails. There is quite a bit to see on this small peninsula, so you might want to make an entire day of your visit here. 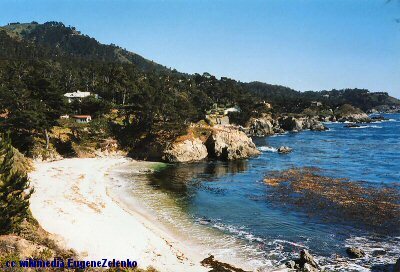 If you are staying in Monterey or Carmel you could arrange a picnic lunch at one of the many restaurants and have a splendid time of exploring all the hidden places here. Just a word of warning however about leaving valuables in your car while you're out on the trails. Please read this information from an interview I did with a Sheriff's deputy about an ongoing problem here and in Big Sur. 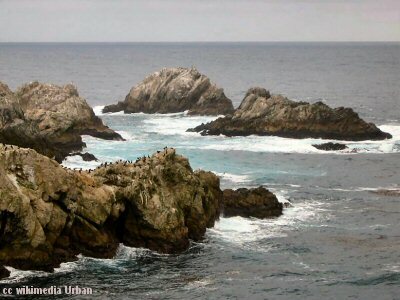 "Deriving its name from the offshore rocks at Punta de los Lobos Marinos, Point of the Sea Wolves, where the sound of the sea lions carries inland, the reserve has often been called "the crown jewel of the State Park System." Pt. Lobos has offered many things to millions of people who have visited it over the years. PLSNR is outstanding for sightseeing, photography, painting, nature study, picnicking, SCUBA diving, and jogging. In addition to the spectacular beauty, nearly every aspect of its resources is of scientific interest. There are rare plant communities, endangered archeological sites, unique geological formations, and incredibly rich flora and fauna of both land and sea." 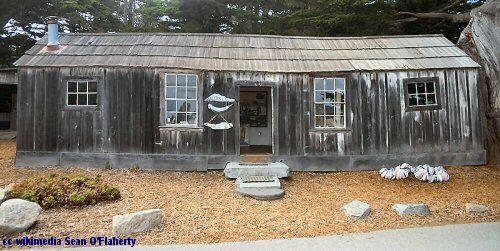 The "Whaler's Cabin" museum (below) was built by Chinese fishermen in the early 1850's and is the oldest structure built by the Chinese in the Monterey area. It contains many artifacts of the era of "shore whaling" that took place here. The whalers would intercept the migrating whales that passed nearby this point.